Saturday morning and I’ve just finished paying bills which I will never do again prior to sitting down to blog because it has nearly sucked all of what little creative writing mojo I had out of me. And trust me, there was very little there to begin with as witnessed by my lack of blogging. I wish I could point to what is keeping me from putting a post together at least once a week. Perhaps I’ve been too busy knitting to write. I have made some progress in spite of the fact that I have several things on the needles. I’ve nearly completed a baby blanket for a coworker who is expecting (yes, another one - if I was a young woman, I would DEFINITELY NOT drink the water at work). I fell in love with the pattern, the Rainbow of Bows Baby Blanket by Janet Jameson. I used Hobby Lobby’s I Love This Yarn as the pattern recommended which is, in my humble opinion, the most reasonably priced, really nice acrylic yarn available, plus there are like, a thousand colors to choose from (may be a slight exaggeration). 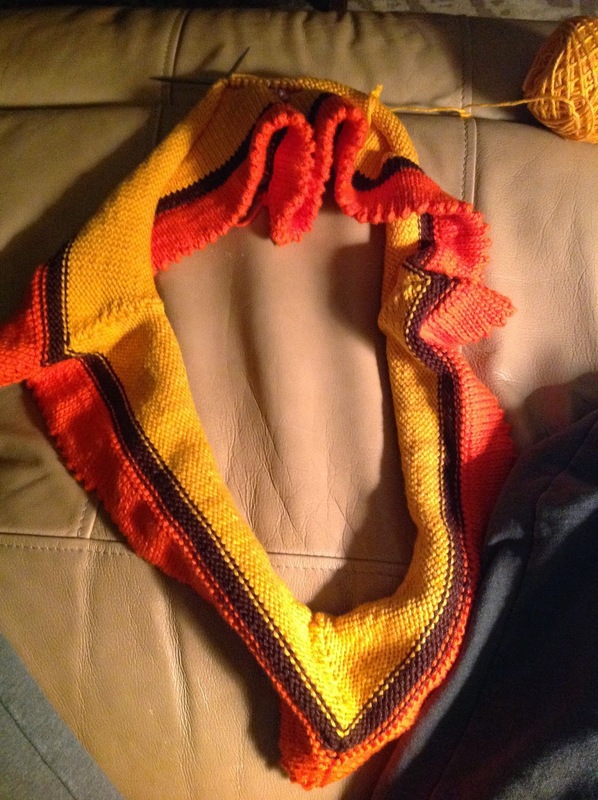 The yarn is held double for the pattern which makes for a wonderfully squishy blanket. The good news is, after I pulled the whole thing out and provisionally cast on those 300 stitches again, I’m back on the right track and honestly, I think this time around my stitches look a little more even and nicer than before. I suppose that’s a by-product of taking enough care so that one doesn’t have to go for a third go-around. I’m a little stalled on a wee dress I’m making for another coworker’s little one. When this coworker was expecting, I had planned a lovely little blanket for her as I did for the first coworker that had a baby but the yarn I’d ordered ended up backordered and by the time I realized I wouldn’t receive it in time, it was too late to do a blanket, so I did a little sweater for the baby instead. I’ve always felt badly that what I gave her was so much smaller compared to a blanket, so I set about looking for another project and found the Emma Tunic by Jennifer Alexander. The baby’s name is Emma, so it all works out grandly. It looks rather plain and dull right now, but will look sweeter once I complete the yoke and add some cute embellishments. In the midst of all the baby stuff, I’ve not done much with other things. I did complete one unremarkable sock and I knit a few rows on a sleeve for my Steampunk Pullover. The rest of the day will be spent running errands and cleaning and of course, knitting. 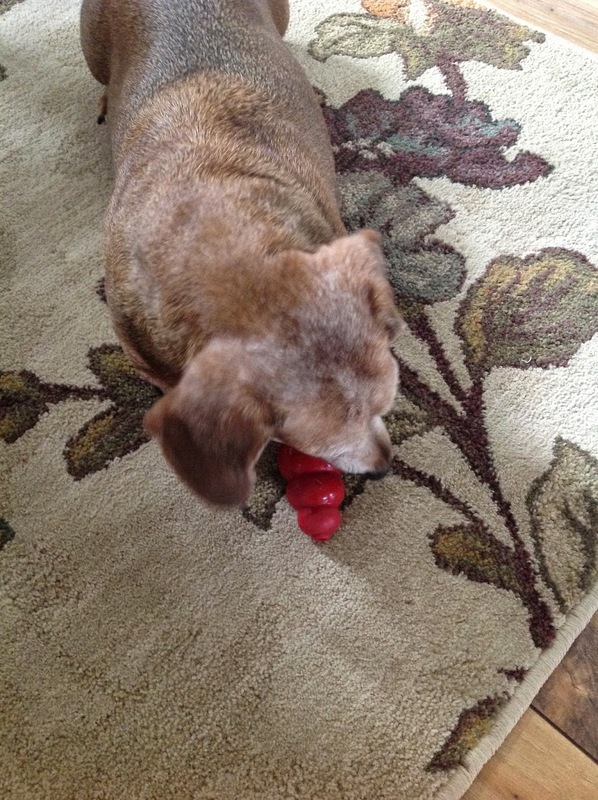 My sweet dachshund, Daisy, was all ready to play when I was trying to take some pictures for this post this morning. Alas, she eventually gave up, poor baby. busy week, indeed! I have made that same rookie mistake. With so many stitches it is hard not to sometimes.